If you’re looking to kickstart your Kinect programming and create some magic on the Mac, then this is the place to be. In this tutorial we use Synapse, Quartz Composer and the Kinect sensor to create a cool motion-activated particle effect that lets you move an animation around your screen using only your hands. Please note, this tutorial has been completed using Mac OS X 10.8 (Mountain Lion). It is also important to note that your Xbox Kinect should be model #1414. If you have the newer model #1474, then you may need to complete this extra step to get your Kinect working. This tutorial will guide you through all the steps necessary to install and use Quartz Composer and Synapse with the Xbox Kinect on Mac. If you have any issues when you reach Step 4, then feel free to download my project files to experiment with. First things first, before we can move forward, you’ll need to make sure you have your Xbox Kinect setup. Follow this guide to get you setup and ready to go. Quartz Composer is an amazing app created by Apple, and distributed via the Apple Developer network. 2. This will take you to the Apple Developer website. Once logged in you should see the Apple Developer Downloads page. Scroll until you see the Graphics Tools for Xcode package. Click the disk image icon to download. 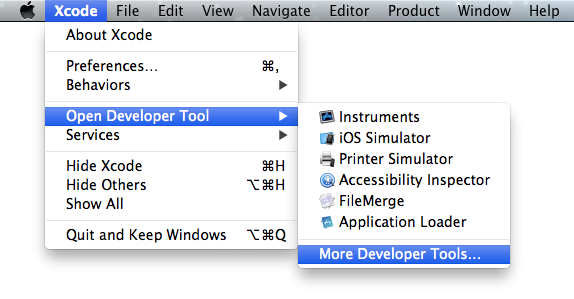 At the time of writing, there is a developer preview of Graphics Tools for Xcode 5 Preview. I’m choosing to stick with the stable version for Xcode 4 until Xcode 5 is officially released. 3. Once downloaded, double click the disk image, and then copy the contents to the Applications folder on your hard drive. 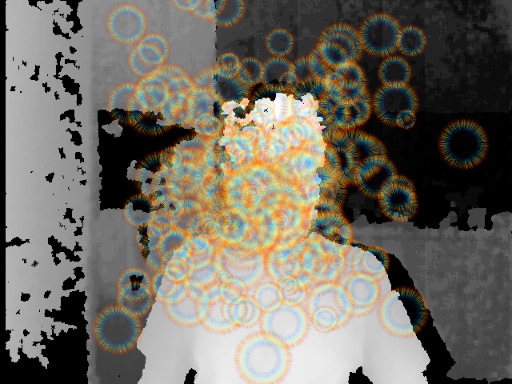 Synapse is an awesome application by Ryan Challinor that will supercharge your Kinect. It’ll recognise your body’s joint positions and movements, and then send all that data to Quartz Composer for us to manipulate. So to get started, let’s install this little wonder. 1. Firstly head on over to Ryan’s site and download Synapse for Mac, and Quartz Composer example project + plugins. Unzip and move the contents to the Kinect folder we created in the previous tutorial (or anywhere you like – this is really just to keep things organised). 2. Next navigate to the following folder on your computer: Library / Graphics / Quartz Composer Plug-Ins. If the Grahics or Quartz Composer Plug-Ins folders don’t exist, then feel free to create them. If you cannot see the Library folder, click the Go menubar option in your Finder, and hold down the Option key to make it visible. 3. From your Synapse folder, move the two files called qcOSC.plugin and Synapse Kinect.plugin to the Quartz Composer Plug-Ins folder. 4. Awesome, now let’s get skeletal! Back in your freshly unzipped Synapse folder, you will find an application called (funnily enough) Synapse. Open it up, and you should see a window appear. Now stand up, bend your elbows, and point your hands to the roof and you’ll see a red 3D skeleton lock onto your body. Wave your hands around and you will also notice the blue swipe marks appear from your movement. Not so fast! Make sure you perform this last step before we head into Quartz Composer. 4. Remember that Quartz Composer example project + plugins zip you downloaded? When you unzipped it, you would have created a QuartzKinect folder. Inside here you will find 4 Quartz Passthrough files, these allow Synapse to send your movement data to other applications (very important). To start, lets open the one called quartz_passthrough, and leave it running in the background with Synapse. And now for the part you’ve been waiting for! This next section will show you how to use Synapse in conjunction with Quartz Composer to create a motion-controlled animation. 1. At this point, you should have Synapse open with your skeleton detected, and quartz_passthrough running to send through your movement data. Now open the Quartz Composer application. When you do, you will see the template chooser. 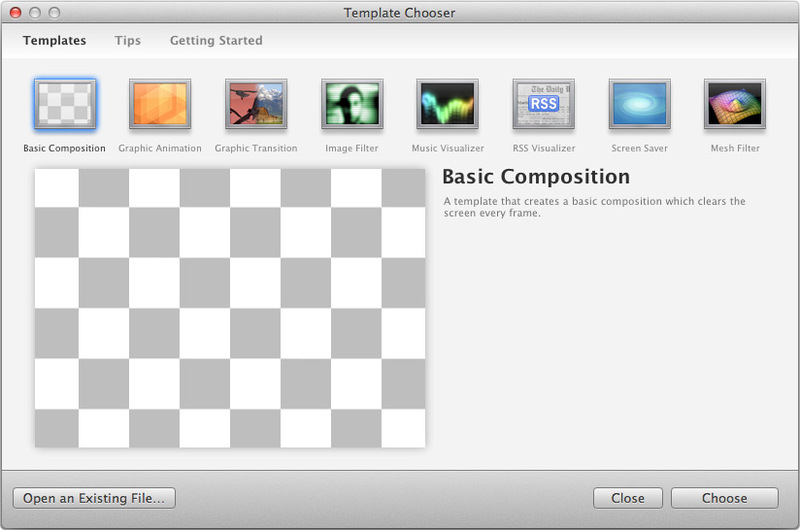 Select Basic Composition and click the Choose button. When your project opens, you’ll see 3 windows. The biggest one is your Editor – in Quartz, you’ll use this visual editor to code up your application. Then you have a Library (aka Patch Library) that contains a bunch of cool patches (aka modules) you can drag and drop into the Editor. And lastly you have the Viewer, which will allow you to preview your application as you build it. 2. 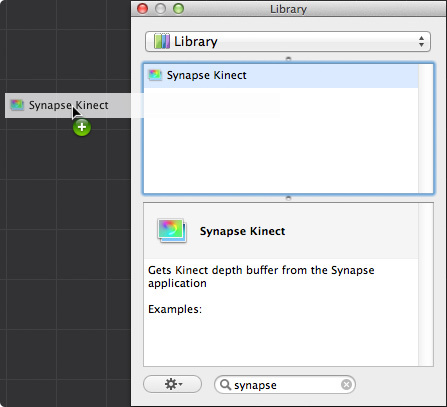 In the Library window, type the word Synapse in the filter search box, and drag the Synapse patch over to the Editor. When you add a patch in Quartz Composer, you’ll notice they often have a list of parameters. To edit these easily, click the Parameters button on your Editor window. 4. 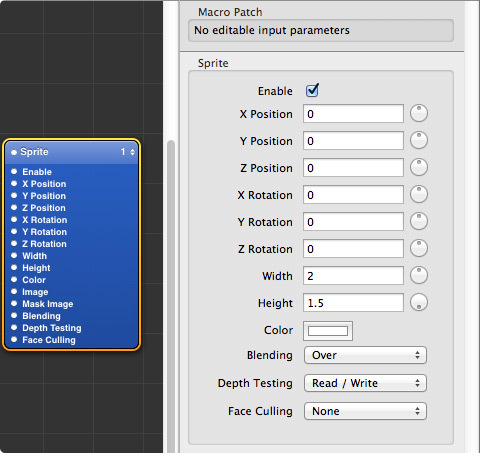 To get our sprite to stretch and fill our Viewer completely, click the Sprite patch, and then open the Parameters pane. Change the Width to 2, and Height to 1.5. If you get to this step and can’t see the Kinect feed, just check to make sure you still have Synapse open and running in the background. 6. Okay, your feed’s working, so how about we add some animation! 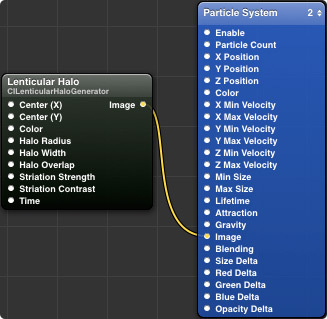 Search your Library for the Particle System patch, and drag it to your Editor. Then search for the Lenticular Halo patch and drag it over too. 8. Now let’s make it move. Search your library for the following patches, and drag them to the editor: qcOSC, Structure Index Member (drag over two of these), Math (and drag six of these). 9. 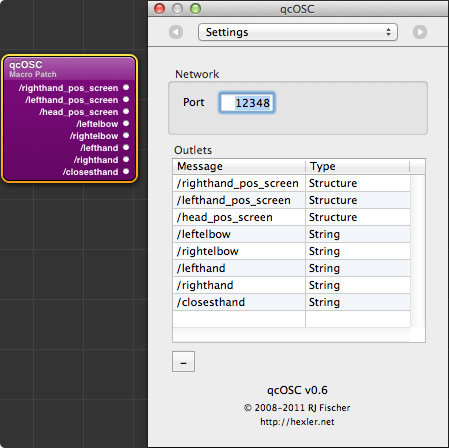 Now click on the qcOSC patch in your Editor, and click the Patch Inspector button. 10. When the Patch Inspector opens, you’ll notice a drop-down menu. Click it and select Settings. Then change the port number to 12348. You’ll notice that the qCOSC patch starts gaining additional parameters. If you don’t see these parameters forming, make sure you completed step 3, point 4. 12. Now we can link it all up! 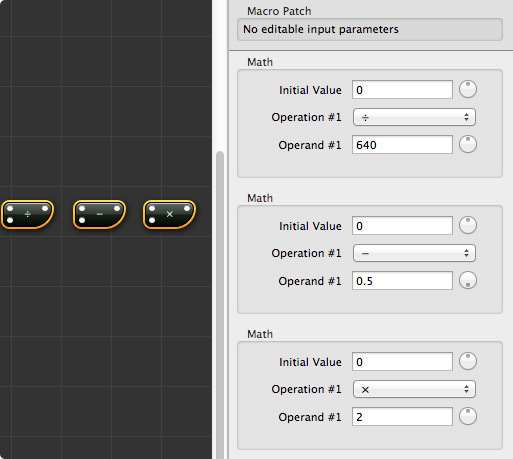 And finally, drag the top right Math (Multiply) to the Particle System / X Position parameter. Now take a look at your Viewer, and move your right hand around. If you did everything right, you should see the particle system following your hand movement. Now, how about we get the vertical y-position working too! This is pretty similar to what we just did, but with some parameter differences on the Math patches. 13. Select the remaining three Math patches, and set their parameters to the following: Math patch #4: 0, Divide, 480; Math patch #5: 0, Minus, 0.5; Math patch #6: 0, Multiply, -2. 14. Now select the remaining unlinked Structure Index Member patch, and set the Index parameter to 1. Now wave your right hand around again, and you should see the particle system following your movement on both the x and y axis. Okay okay, I hear you. “The lenticular halo effect is nice, but what else can I do?” Lucky for you, Quartz composer comes with a raft of patches for you to experiment with. In one of my previous posts, reader Luis commented that he was looking forward to a Quartz Composer motion tutorial so he could put together something for his wedding. With this inspiration in mind, let’s alter our project to become all lovey dovey! 1. Click the Lenticular Halo in your Editor and press Delete to remove it. 3. 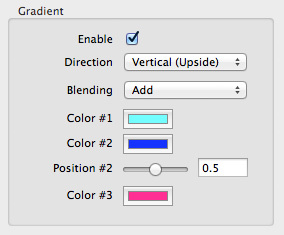 Now open the Parameters for the Gradient patch. 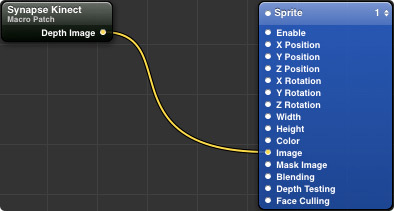 Select 3 colours of your choice, and change the Blending option to Add to overlay our Kinect feed. 4. Now we have our filter in place, we’re going to import an image to use with our particle system. Search the Library for Image Importer and drag it to the Editor. 5. Now open the Parameters for Image Importer and you’ll see a field called Image Location. The easiest way to fill this is to simply drag an image from your desktop onto the empty field. Just remember to make sure that the Quartz Composer application is in the foreground when you do this or it won’t register. Alternatively, if your image is in the same directory as your Quartz Composer project file, then you can just write the name of your image here. 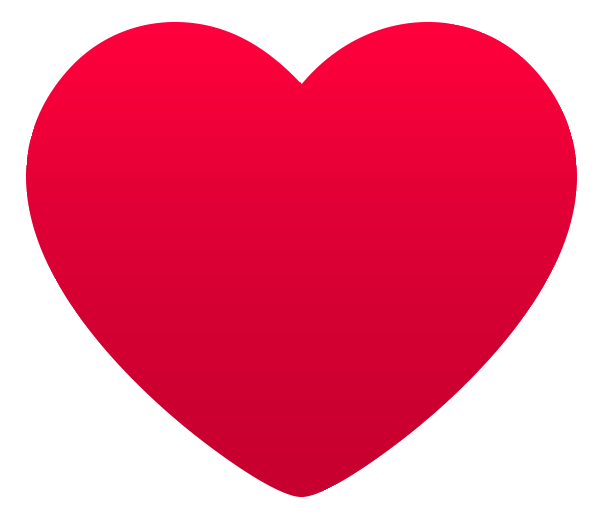 I’m going with a heart image to match our theme. 6. 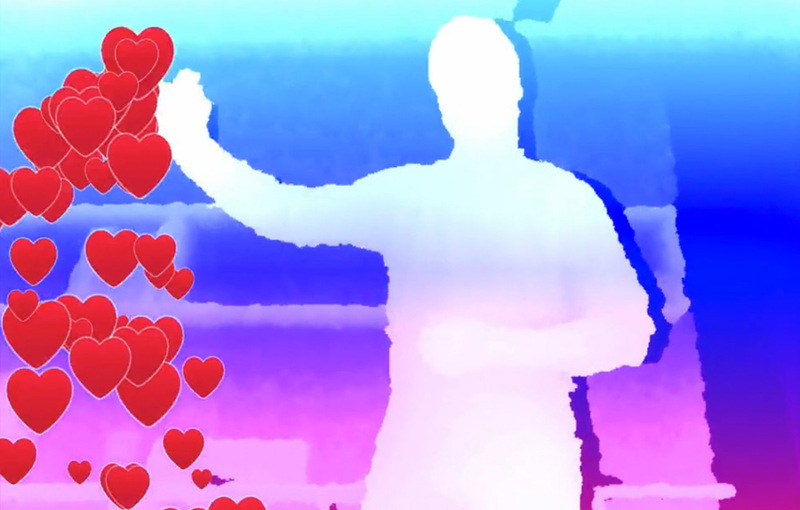 Lastly, we just need to connect our image to our particle effect. Click the circle next to Image Importer / Image, and connect it to Particle System / Image and watch the magic happen! We’ve just been through a lot of really detailed instructions. If your project is not tracking your hand movements, don’t worry, there are a few things we can do to try and fix the issue. 1. 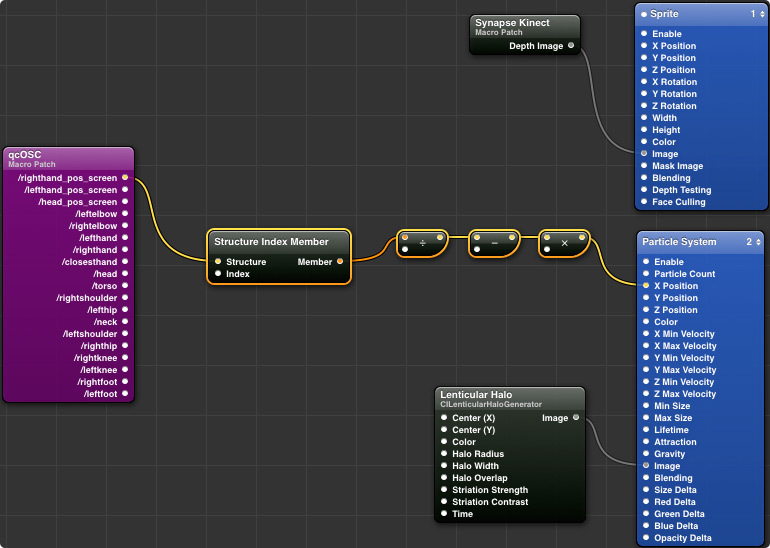 Firstly save your Quartz project, then close Synapse, quartz_passthrough & Quartz Composer. Then re-open them one at a time. Synapse first (then hold your hands to track your skeleton), quartz_passthrough second, and then open your saved Quartz Composer project last. 2. If your qcOSC patch is showing too many parameters (like this), then you’ve probably closed and re-opened Synapse or quartz_passthrough during the tutorial. To fix this, try quitting Synapse & quartz_passthrough, then deleting the qcOSC patch. Then re-add the qcOSC patch to your project, and link it back up. Save your project, and then follow the instructions above to re-open the applications in sequence. Phew, you made it! Hopefully you were able to get everything up and running. Remember, if you’re still having trouble, you can download the Quartz project files I created to play around with. If you have any other issues, then please shoot them through to me in the comments and I’ll try to add them to the troubleshooting section above. Your tutorials are wonderful and clear! As a total beginner with processing and kinect I found these easy to follow. I would absolutely love to see more tutorials and mini project walk-throughs. Thanks Arturas! I’m really glad you’re enjoying the tutorials. There’s definitely a lot more on the horizon, and if you have anything specific you’d like to find out about feel free to let me know. This looks amazing, but I am having a few problems. 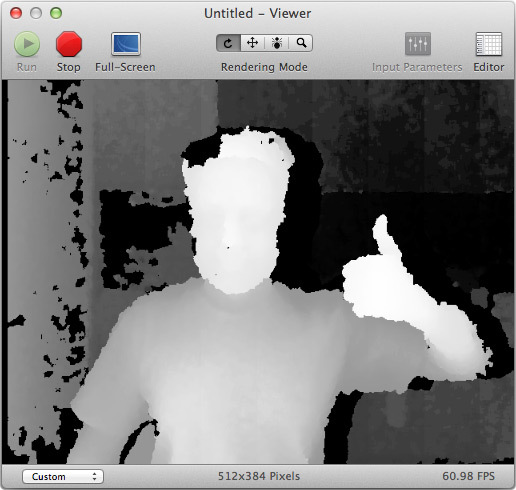 1) The Synapse displays depth data (and the Kinect works with depth and images in another app, so I know it’s working on my Mac). But I’m not getting a “skeleton” so it doesn’t seem to be tracking my body. 2) The Quartz plugin doesn’t seem to be able to connect to Synapse passthrough app. It displays ‘binding to port 12347′, but in Quartz Composer I get ‘Error opening socket on specified port. Please choose a different port.’ no matter what port I enter in the plugin’s settings. What I’m seeing in QC is that I get the depth data (and see my body in the kinect test) but no body tracking, so (for example) the particle lens flares stay in one place and don’t follow body position. I turned off the Mac OS firewall, and see the same thing. I”m running OS X 10.8.4 on an iMac. Any suggestions of what to try? Follow through the blog steps again until you get to the skeleton step. Now make sure your camera is positioned correctly, and that there’s adequate light in your room. Step back as far as you can to make sure your whole body is visible in the Synapse window (for Synapse to recognise your body it needs to see your legs too). Raise your hands up at 90 degree angles and hold that pose until the skeleton snaps to your body. After this step, open up the quartz_passthrough to setup the port, and finally open Quartz Composer and add the Synapse Kinect and qcOSC patches. Set the port again for the qcOSC patch, and hopefully everything works. Please let me know how you go – it’d be great to get you up and running. you did a great work here, thank you thousand. This is my current condition: I have an “Error opening socket on specified port” as Laird, but it occurs ONLY when I paste the particles generator nodes into a “render in image” macro patch. I attempt to address only the halo effects to a syphon server and then to mad mapper. But as I cut and copy the (until that time working) composition into a macro patch, the error advise pops up. My osx is 10.10.2. 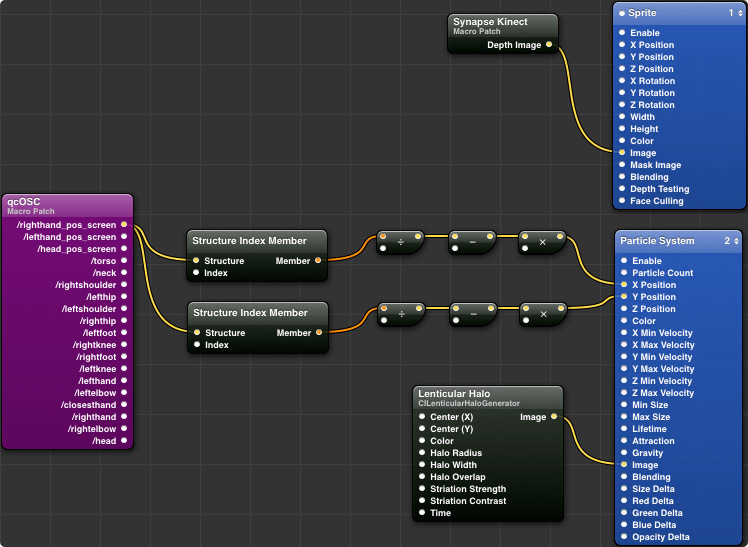 All the steps of this tutorial went like a charm except for something on the “setup kinect for 10.8″ guide. Any help? is it possible to add ” /rightfoot_pos_screen – structure ” in qcOSC ? on step 10 QC don’t take port (“error on opening socket on specified port. Choose different port”). Somebody knows this problem ? Thanks..
Hi Oula, I’ve just made a comment below to Nico that might help. If you can let me know and report back, hopefully we can get this working for you. If this is a common occurrence I’ll need to modify or make a note of it in the tutorial. I have error too “Error on opening socket on specified port. Choose different port”. I do it strict on this tutorial. google did not help. please who know, help. Hi Zorn, I’ve made a reply to Nico below that may address this. Can you also let me know if you have followed the setup tutorial? Thanks, Glen. One more question. Will this tutorial work on OS X 10.9 Mavericks? I think this issue can sometimes stem from repetition. So if you’ve attempted to follow the tutorial, and something crashed or you closed one of the applications, then the port might still be allocated. The best thing to do in this situation is to close everything and repeat the steps. If it really doesn’t work, maybe try resetting your machine, and of course ensuring that the Kinect is plugged in correctly and that the green status light is on. Let me know if this helps, and if not, if you notice any other anomalies that might help to narrow down the issue! I’ve tried both resetting and shutting down my computer, but every time I open the quartz passthrough it is always unable to bind to the port. udpsend: unable to resolve host localhost. bind to port 12347 unsuccessful. there is probably something already bound to this port. What is the problem? Any solutions, thanks. I just replied to Nico above. Do you want to give that a try and let me know if it’s still happening? If you can describe any differences you may have to the tutorial above, that might also be helpful (like different versions of applications etc.). Good luck!! Thank you so much for this great tutorial~!!!! Hey cool link, I’ll take a look and see what I can come up with! Absolutely amazing! I’m a big fan of your blog. Thanks a lot. I’m working in some projects. Do you know if there’s something like synapse but to recognize fingers? Best. Thanks again. And happy new year! Glad you’re liking the tutorials. For fingers, you might like to try the Leap Motion controller, because unfortunately I think the Kinect might be too low resolution to capture any fine motor/joint movement. Happy new year to you too! First, Thank You very much for making Synapse available and doing this very detailed and clear tutorial. I am an Artist, not a programer, and have been trying for a while to make the Kinect work. I followed the tutorial yesterday, and it worked fine, but today, it doesn’t work anymore. I have started again from scratch, and I keep getting a message “Error opening socket on specified port. Please choose a different port”. I downloaded your project files and opened the, same thing. I tried restarting the computer, repairing permissions, and running Diskwarrior, to no avail. Nice tut. Made it and it been working ’tilll I tried to save qsc and run it. Got the same problem with socket opening for 12348 port in qcOSC. Jan 17 21:15:46 Swoolfs-MacBook-Pro-2.local mDNSResponder: Client application registered 2 identical instances of service Swoolfs-MacBook-Pro-2:1234832(qcOSC)._osc._udp.local. port 12348. Jan 17 21:16:00 Swoolfs-MacBook-Pro-2.local mDNSResponder: Client application registered 2 identical instances of service Swoolfs-MacBook-Pro-2:1234832(qcOSC)._osc._udp.local. port 12348.
seems there’s something worth to look at in qc – qc_passthrough interconnection. Hey, Amazing work, so easy to follow and works great! I was wondering if you new what the parameters would be for the Z Position is possible at all? would like the image to follow me in and out of the frame. annnd, sorry i meant to ask this in the post too, is it possible to have the system track another object such as a certain coloured ball on a pool table? Thanks a lot for the tutorial. I have a problem at the beginning because synapse don’t seems to work on my computer ? I have OS Maverick, is there a problem with this one ? Hi Nico. It most likely is to do with Mavericks. I’m half-way through writing a new tutorial to get the Kinect fully functioning in Mavericks, and know it’s something a lot of visitors are waiting on. You may like to add your email to the signup form in the sidebar, which I’ll use to email everyone when the tutorial goes live. Hopefully that helps you out… soon! Hi Thanks so much for the tut. I had this all working, someone borrowed my laptop and it came back with the “error ports” issue that many people are having. It doesnt seem to bind ports in the passthrough filter and when i open a new quartz project and load qcOSC, the patch has no options, its just am empty purple box. so its not receiving any feed from the passthrough. my synapse is working perfectly. seems the only answer is to restart everything. which ive done a few times. anyone else find a solution to the port issue? i cant even change th eport settings for qcOSC as it doesnt seem to load properly. Hi guys, here is how i solved the issue above. passthrough only says binding to port, no other info should be visible. In quartz, when you load in qcOSC, it will load up with no inputs. click on patch inspector and put in the 12348 port there. that will tell it to look for the output of passthrough /plus. and that will solve the port error problem we have had. sorry correction. Even when i set the port it gives the port error. I have restarted everything so many time. Do anyone have a solution for this? Open quartz, hit cmd+W several times to close all open compositions. make sure to close also the quartz viewer and any other quartz window, then close quartz, close synapse and passthrough and any other visual application like madmapper, syphon etc. first start synapse, then quartz passthrough plus and then quartz. since there is nothing else in the background of quartz running, you should be able to open your port! it took me half a day to figure it out, hope that helps also other people! I have noticed that finixg credit activity needs to be conducted with techniques. If not, you are going to find yourself destroying your positioning. In order to succeed in finixg your credit rating you have to always make sure that from this minute you pay any monthly costs promptly before their timetabled date. It’s really significant simply because by certainly not accomplishing that, all other methods that you will decide on to improve your credit positioning will not be useful. Thanks for expressing your suggestions. Hey Glen, Great tutorial I came across the Synapse a while ago and played around. Thanks for the updated fix I will try and work through it now. I have a question for a project I am working on basically I would like to delete the background to black and only have the person in front of the camera visible. Is this possible using the kinect? I am not able to get the kinect to track my hand it will make the animation only move in a diagonal line. Hi Powerwheeler. This can sometimes be a simple mistake with your project. You may just have linked up an element incorrectly or entered an incorrect value. Try downloading the project files from here and see if you have the same issue. Let me know and we can work it out together. Hi Elliott, this might be an easy fix – you’ll just need to go back over Step 3 and ensure that the Synapse plugin is added to your Quartz Composer plugin files. Check out this step specifically. Let me know how you go! Thanks Glen! Great tutorial!! After I upgraded my OSX to Maverick yesterday, Synapse doesn’t recognise my bone anymore. Do you have any suggestion? I’m Tung, a visual artist from Saigon, Vietnam. Thank you very much and very appreciate your contribution. Great stuff Tung. If you’ve just upgraded to Mavericks, then this tutorial should get you up and running again. Just remember to complete the uninstall section first! If you’re embedding the QC Composition (qtz) into an XCode application, XCode 5 has a bug that makes this really hard. The all important QCView and QCParametersView objects now stop the .xib file from loading. I have an important query, currently I have the operating system Mountain Lion to install some drivers asking me to update the computer this is for the use of the computer to another software nothing to do with this issue, the question is: if I install on my computer Maveriks going to be able to run this patch both qc and max? or should I not update? Greetings !! I have an important query, currently I have the operating system Mountain Lion to install some drivers asking me to update the computer this is for the use of the computer to another software nothing to do with this issue, the question is: if I install on my computer Maveriks going to be able to run this patch both qc and max? or should I not update? Hi!! I really want to thank you for making this amazing tutorials! it was really helpfull, and without this i couldn’t make this by my own haha. It’s just i have one problem, the image in .png or .jpeg doesn’t appear, it looks white, i don’t know what is happening, if you could answer it would be great! thank you! Outstanding work! This is just great! Tested and working on my Mac!! Quartz Kinect plugin missing? 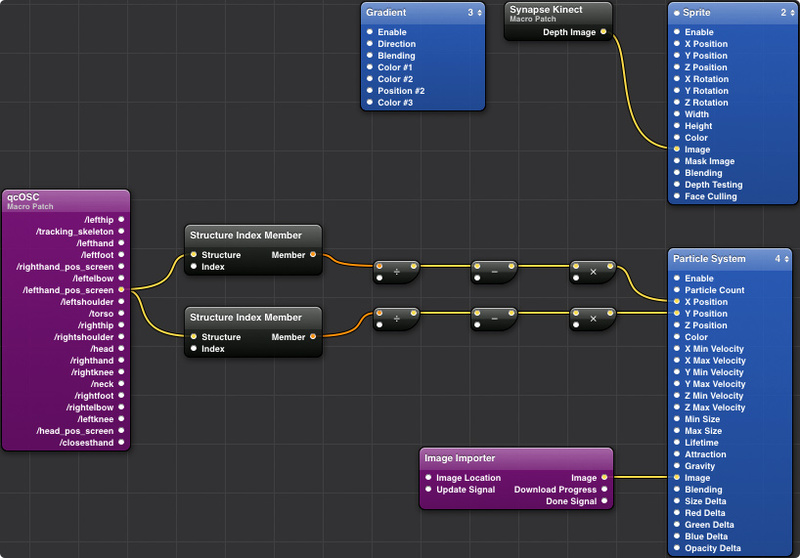 is that making reference to “Synapse Kinect.plugin” placed in librayry/graphics/Quartz composer plugins? Cause it is there (not sure also why plugins in there lost images), Well, appreciate much your help. imac 11,1 27″ i5 2.66, ati radeon hd 512mb, 12gb ram, 1tbhd, kinect 1414, Quartz 3.1, OSX 10.6.8. Please help! thanks a lot. Thank you for the awesome tutorials, I have a #1473 and unfortunately the link that you mentioned is down (cviz.wordpress.com), is there any other reliable tutorial to get the 1473 to work? hello, you can interact with the whole body and not just with your hands? This is really pretty cool. I am very interested in adapting something like this to allow a virtual window for the OS X desktop using head tracking to calculate parallax for the desktop wallpaper to give the illusion of looking out of a window when sitting at your computer. I’m a Computer Science and Computer Engineering student and I would be happy to work on this with anyone if they are interested in doing this as well! thanks in advance and congratulations for the great work! Hi Glen, thank’s to share you know how for everybody. in poppet show, mixing some character are virtual (video) controled by kinet and other realy poppet 3d doll. I know this is several years ago, but is Synapse and hacking a Kinect in Quartz something that is still going on? The reason being is I’m not having much luck with getting Synapse to open, and all posts are 4 years old. Is anyone else having a problem with Synapse… it keeps crashing when I try to open it. Any advice?